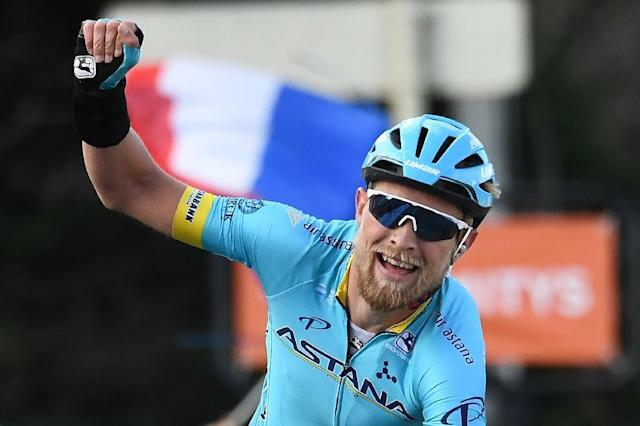 Pélussin (France) (AFP) - Dane Magnus Cort Nielsen won the fourth stage of Paris-Nice on Wednesday escaping from the other survivors of a stage-long breakaway on the run in to the finish in Pelussin. Pole Michal Kwiatkowski, who rides for Sky, kept the overall lead on the even of a 25.5km time trial. Astana's Cort Nielsen was one of the last four riders from a breakaway that formed in the first 15 minutes of the stage. He shed the other three in the last 400 metres to win the 212km stage in 5hrs 3min and 49sec. "We didn't have a plan but I was feeling good in the morning and I decided to go in the break," Cort Nielsen said after the race. "And then when you're in the break, it's the goal to be in the finale." Belgian Thomas De Gendt was second, seven seconds back, ahead of Italians Giulio Ciccone and Alessandro De Marchi. 1. Magnus Cort Nielsen (DEN/Astana), 5hrs 3min 49 sec, 2. Thomas De Gendt (BEL/LOT) at 7sec, 3. Giulio Ciccone (ITA/TRE) 13, 4. Alessandro De Marchi (ITA/CCC) 18, 5. Lilian Calmejane (FRA/DEN) 48, 6. Valentin Madouas (FRA/FDJ) same time, 7. Sonny Colbrelli (ITA/BAH) s.t., 8. Matteo Trentin (ITA/MIT) s.t., 9. Philippe Gilbert (BEL/DEC) s.t., 10. Michal Kwiatkowski (POL/SKY) s.t. 1. Michal Kwiatkowski (POL/SKY) 16hrs 52min 27sec, 2. Luis Leon Sanchez (ESP/AST) at 5sec, 3. Philippe Gilbert (BEL/DEC) 10, 4. Egan Bernal (COL/SKY) 11, 5. Matteo Trentin (ITA/MIT) 14, 6. Tony Gallopin (FRA/ALM) 15, 7. Rudy Molard (FRA/FDJ) 17, 8. Romain Bardet (FRA/ALM) s.t., 9. Oliver Naesen (BEL/ALM) 18, 10. Félix Grossschartner (AUT/BOR) s.t..